The right choice of licence-free boat is crucial to ensuring you have a great holiday. 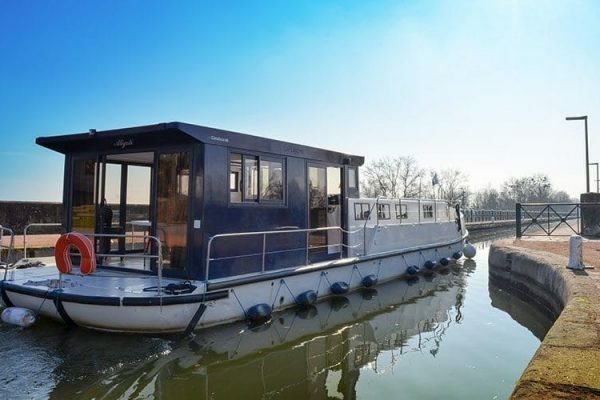 The pleasure boat you rent will be your home for the duration of your waterway cruise. 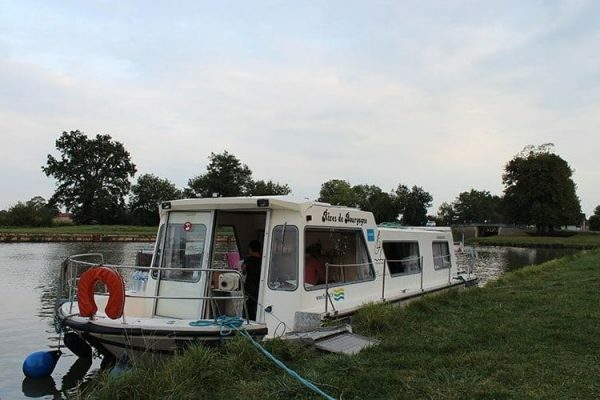 All our houseboats offer standard minimum comforts such as: pressurised hot and cold water, shower, WC, kitchen, heating. The detail and quantity of these vary from boat to boat. The Premium range allows you to opt for maximum ease and pleasure on your next waterway cruise with licence-free boats that afford every comfort. Cast off your moorings with a boat in the Premium range. Take your place aboard and discover the facilities on these spacious and comfortable vessels. Take advantage of the fully-equipped kitchen (hob, sink, oven, refrigerator, coffee machine, juicer and toaster) for a hassle-free waterway cruise. There's even a dishwasher on these licence-free boats (unless you’re embarking in Belgium or Germany). Our Classic range of licence-free boats is designed to satisfy neophytes’ desires for discovery but also delight the most seasoned boaters. These boats, recommended for family cruises, offer comprehensive sanitary facilities (WC, shower and washbasin), along with a kitchen equipped with a hob, oven, sink and fridge. A complete set of kitchen essentials (crockery, glasses, pots and pans, etc.) means you don’t have to worry about what to bring aboard. You can also opt to add bath and/or kitchen linen (either now, or at the base when collecting your boat). Bed linen is included with the rental of your Classic range boat. Our Low-Cost licence-free boat range makes waterway navigation affordable, allowing you to discover the pleasure of casting off. A great offering for those who wish to discover waterway tourism. Les Canalous intend to continue making waterway tourism accessible to as many people as possible. If you've never taken control of a boat for a waterway cruise, or are looking for licence-free boat rental at the best possible price, then our Low-Cost range is for you. All the safety features at a low price so you can enjoy this original way of discovering the terroirs of our regions. Our specially adapted Access range boats are designed to make waterway tourism a pleasure for everyone. These licence-free boats can accommodate between 4 and 6 people, allowing you to prepare and follow your own itinerary. They’re adapted to suit one, or even two, wheelchair users, offering all the comfort and safety features you require for a holiday with total peace of mind. We invite you to discover all the possible options to create your own tailor-made dream holiday. 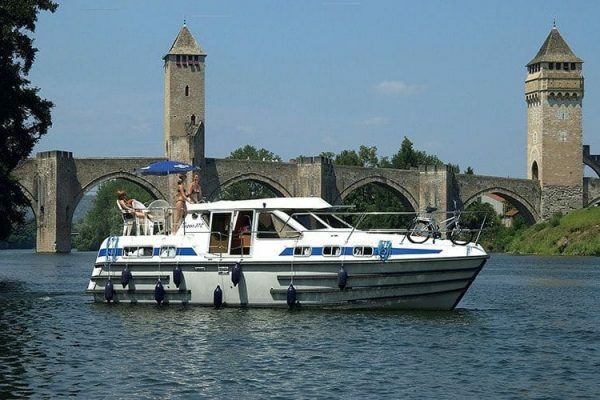 Introduced in 2018, the "Propriétaire" fleet has been designed for boaters who want to take full advantage of the experience of river tourism, while enjoying the same comfort on board as a boat owner. Thanks to its great habitability and the breath-taking view it offers of surrounding nature, this fleet is ideal for a private holiday for a small group. 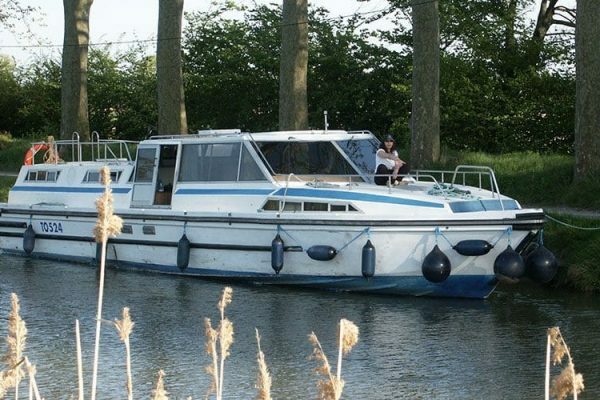 It is also perfectly suitable for hire with a skipper for those who do not wish to drive the boat during their holidays. Mooring lines - Lifebuoy - Boat hook - Mooring stakes and mallet - Anchor + Mooring gear - Fenders - 10 litre bucket - Water hose - Gangplank. First Aid Kit - Logbook - Lifejackets - Fire Extinguishers - Torch (batteries not included). Ashtray - Broom - Dustpan and brush - Dish brush - Hangers - Hand brush - Toilet set - Clothes pegs - Basin - Dustbin - Mop. Tumblers - Table glasses - Dinner, soup and dessert plates - Bowls - Coffee cups - Platters - Salad bowl - Coffee jug + filter holder - Water jug - Cutlery and cutlery holder - Salad servers - Juicer - Teapot. Trivet - Bread basket - Plastic boxes - Can opener - Bottle opener - Corkscrew - Vegetable knife - Carving knife - Ladle - Skimmer - Wooden spoon or spatula - Cutting board - Pans - Lids - Frying pan - Salad spinner - Pressure cooker or Dutch oven - Strainer. Bolsters or pillows - Bolster or pillow case - Sheets - Blankets or duvets. (supplied on the entire fleet except the Low-Cost range). Connects to the 12-volt cigarette lighter socket (max 100 watts) to allow you to charge phones or digital devices. Equipment for rent from some bases. Some boats are equipped with a 220-volt shore power connector. All boats are equipped with a sink, gas hob, 1 to 4 rings. Most boats are equipped with an oven (except for the Fred 700, Riviera 750, Linssen, New Concorde, Triton 1060 Handy, Rego 2000). The Tarpon models have an extractor hood. All boats have at least one washbasin. Some are equipped with washbasins in the cabins. All boats have at least one shower. Some have several. 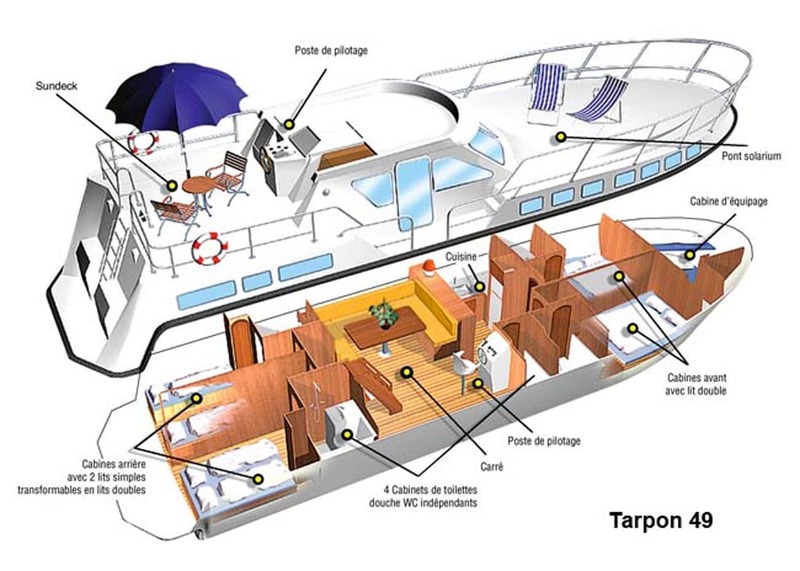 All boats are equipped with toilets, some have several, they are sometimes separated from the shower room. 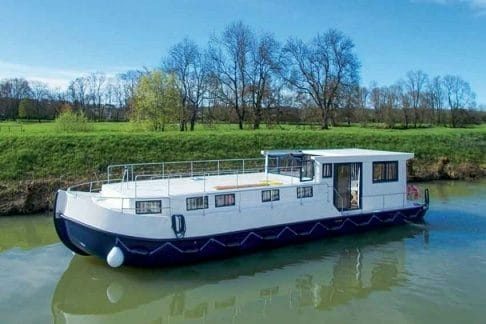 Les Canalous will take you on a water­way cruise to dis­cov­er France and Europe from its bases. The South of France via the Canal du Midi (Car­cas­sonne, Homps, Agde, Colom­biers), Camar­gue (Carnon), Char­ente (Cognac), Lot (Cahors, Luzech). Dis­cov­er water­way tourism depart­ing from Alsace (Hochfelden), Mayenne (Daon), Aquitaine (Fourques-sur-Garonne), Brit­tany (Redon), Ardennes (Pont à Bar), North­ern Bur­gundy (Coulanges sur Yonne, Châtil­lon en Bazois, Digoin) and South­ern Bur­gundy (Louhans, Pon­tailler sur Saône). We also offer boat rental in Europe with Mara­no and Chiog­gia in Italy, Prague in the Czech Repub­lic, Fürsten­berg in Ger­many, Eek­lo in Bel­gium, Woubrugge in the Nether­lands, Rybi­na in Poland.